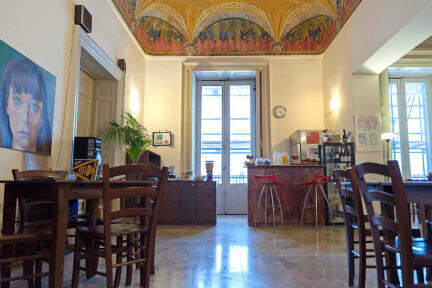 Beautiful hostel right in the center of Catania. Facility-wise the hostel is basic and a bit noisy. However, the beds are reasonably good, breakfast is very good for a hostel and the hostel is quite clean. It is not super-cosey, but a great place to meet people. The great staff and classical atmosphere probably make this the best hostel in Catania; that I can really recommend to hostel travelers! The hostel has extraordinary fresco's on the ceiling, so you sleep under a classical piece of art! Spacious hostel with high ceilings and proper bunk beds with curtains. Close to you bed you have a wooden locker for which you get a padlock with key, but you can also use your own. There are two common rooms, a kitchen, different bathrooms ad a rooftop terras which is also a bar during the evening for other guest not staying in the hostel. The reception is staffed 24/7. You can leave you luggage before the check in and after the check out at the hostel. The location is as central as it can be.